We lifted the engine from the chassis and removed it, leaving the chassis exposed and without anything else attached. This is where we diligently scraped off all the rust, removing the Crossmember and welding a new outrigger on to replace the one that had actually collapsed in on itself. 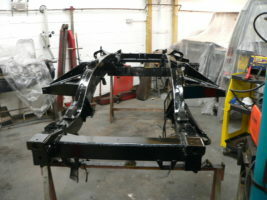 We removed the afflicted areas and replaced the metal so that it looked better than new, then we treated the entire chassis to help keep it preserved, then four layers of black paint allowed us to protect it from any damage or moisture, we decided to keep the chassis separate from the rest of the car until we could build up the axels and make it mobile first.